NEW YORK (AP) Enes Kanter was so good after coming back that it didn’t matter that Kristaps Porzingis went out. Kanter had 22 points and 14 rebounds, and the New York Knicks beat the Miami Heat 115-86 on Wednesday night despite losing their leading scorer to a sprained right ankle after 2 1/2 minutes. Back after missing three games with back spasms, Kanter had his way against a Heat team missing starting center Hassan Whiteside because of left knee soreness, going 7 of 9 from the field. ”Enes was a monster today,” Porzingis said. Porzingis had started quickly, making his first two shots before he was hurt chasing the ball near the baseline by the Miami bench. Justise Winslow stepped on his foot, causing Porzingis’ ankle to turn awkwardly, and he was helped to the locker room during a timeout. The Knicks said X-rays were negative and that their leading scorer was available to return, but they later ruled out a return in the third quarter. There was no need by then the way they were playing. Courtney Lee added 17 points for the Knicks. Kelly Olynyk had 18 for the Heat, who lost in Cleveland on Tuesday and finished their trip 2-2. They had won six straight at Madison Square Garden. Point guard Goran Dragic said energy, especially defensively, was the team’s biggest problem. New York made nearly 64 percent of its shots in taking a 33-22 lead after one, then extended it to 65-44 at halftime on one of their prettiest baskets of the season. Jarrett Jack got the ball after a Heat miss, fired it all the way down from the free throw line to the other end of the court, where Tim Hardaway Jr. leaped and threw it in in one motion from 21 feet to beat the buzzer. The lead ballooned to 84-54 in the third quarter. Heat: Bam Adebayo, who shot 7 for 7 in Cleveland, made his first four shots starting in place of Whiteside. … Miami owned a 12-game winning streak in New York that was snapped. Besides their run at MSG that started nearly four years ago, the Heat have won six straight over the Nets in Brooklyn. Knicks: Rookie G Frank Ntilikina missed the game because of a sprained left ankle. … Joakim Noah was inactive after playing for the Knicks’ G League team earlier Wednesday. Noah, who played three minutes Monday in his only appearance since returning from a 20-game suspension for violating the anti-drug policy, had nine points, five rebounds, four assists and one block for Westchester. Rookie Damyean Dotson did play in both games, scoring 23 points in Westchester’s loss and getting in this game in the fourth quarter. Heat coach Erik Spoelstra said Whiteside had been sore the last few weeks and had been using the day after games to rest. He said Whiteside would be evaluated Thursday when Miami is back home, though didn’t believe an MRI would be necessary since Whiteside already had one. 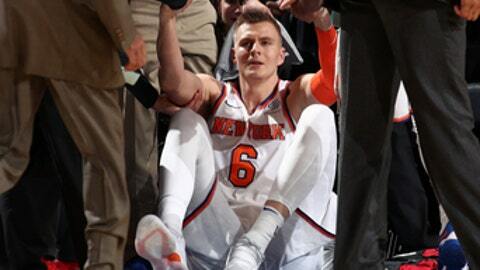 Porzingis said he thought his injury looked worse than it was and hoped he could return Sunday. He had hoped to even get back in Wednesday’s game and told Kanter at halftime he was all right. ”He’s a strong unicorn,” Kanter said. Heat: Host Charlotte on Friday night. Knicks: Host Orlando on Sunday.